Perhaps today more than ever, journalists are constantly dealing with legal, ethical and moral issues in the pursuit of truthful storytelling. To truly be a successful journalist in today's world, stories must be approached in a fair, accurate and objective way. The journalistic code of ethics has been instilled in me ever since learning about landmark cases such as Tinker v. Des Moines Independent School District and Hazelwood School District v. Kuhlmeier in the freshman beginning journalism class. There, we also analyze hypothetical situations that journalists could find themselves in (a copy of these situations can be found below). With a solid ethical background, I began my time on The ReMarker equipped to handle common issues such as anonymous or biased sourcing, protected-speech laws and inaccurate news gathering. But as a staff writer, I also was equipped with knowledge of the maturity needed to tackle sensitive topics. Every issue-driven story must be approached without personal biases, interviews must be conducted with courtesy and respect and the impact of a story on our community must always be considered. Because as journalists, we hold a humbling power to definite a community's values — a power which comes with the responsibility to use the stories we write to impact and represent our communities to the best of our abilities. During the law and ethics unit of our freshman beginning journalism course, I learned and polished my understanding of the basic journalistic code and its history. Using the Supreme Court cases of Hazelwood v. Kuhlmeier and Tinker v. Des Moines School District — along with the more contemporary challenges including media literacy studies, determining credible sources and even learning how to detect fake news — all staff members of The ReMarker start with a grasp of the free press at its core. And through this curriculum, the sense of my inherited responsibility as a journalist has been even clearer through the years. Click the images below to view more on our curriculum and see highlighted content I found of top importance. Here you will find a summary of how common legal and ethical questions frequently come up in my work. Unprotected speech For situations where the First Amendment does not protect a journalist's speech — situations such as obscenity, certain types of defamation and the use of what's been known as “fighting words” — The ReMarker upholds principles designed to avoid these situations in the first place. One of these principles is a belief in working with school administrators rather than against them. Frequently, we will proactively seek advice of school administrators to help shape content that avoids unprotected speech. For example, before starting our cover story on the school's controversial alumnus Richard Spencer '97, we approached our headmaster. And with his input, the reporting team and I worked to refine our coverage of Spencer's explicit language — leaving out any unnecessarily obscene language. Click here to read the cover story on Spencer. Anonymous sources In order to fully cover our school's sexual education program — or lack thereof — in a 2016 cover story, we talked to a sexually active senior at the time about how well the school's curriculum had prepared him. This source decided he would need to be protected with anonymity to avoid ridicule or judgement from others. So to make the subject feel as confident as possible to tell his experience, we decided that the integrity of the article's facts and research would not be compromised by using this anonymous source. Click here to read how this source's voice was incorporated into my writing for the story. Permissions It has always been The ReMarker's policy to always use student-driven content above anything else. However, when it is necessary to use other types of content — such as small images of movie posters for a review — I make sure all our staff members know and follow the set of guidelines articulated by the Creative Commons. The rightful use of content is something I take very seriously, and I am very cognizant of potential legal ramifications when intellectual property is misused. And understanding the necessary copyright, intellectual property and acceptable use policies is fundamental before even considering using a photo found on the internet. Click here to see the Creative Commons attribution guidelines The ReMarker follows. To properly cover your bases as a publication, it's important to have clearly articulated and communicated policies. In the event of exterior pressure from readers on a particular issue, we want to be sure to have a foundation to point back to as a guiding principle. Because of this, I worked over the summer to refine The ReMarker policy forms posted in the publications suite and in the commentary section of the newspaper. Hover over the images below to read more information. Click to enlarge. 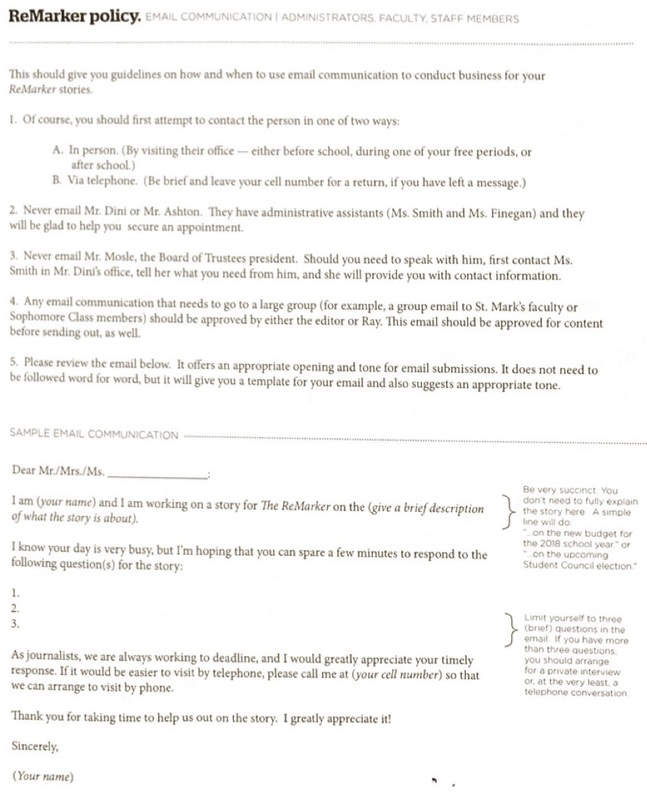 Often times, sources who are not informed on The ReMarker's busy work flow ask interviewers to send them a copy of stories prior to their release. Unless the sensitivity of the story would require this, it's important to articulate our policy against distributing unfinished content before it's finished. When a student wrote a letter to the editor last year with over 1,000 words, it was necessary to institute guidelines for more succinct letters in the future. We now have a 300-word limit communicated clearly in our commentary section of the newspaper. I was able to use this policy for our last issue of the newspaper when I received a letter that exceeded this limit. This policy was created as a guideline for new staff writers to follow as a code of conduct in approaching sources for interviews. We want to always go out of our way to be respectful and appreciative of the time given for interviews.